The artwork featured on our website is very important to us. 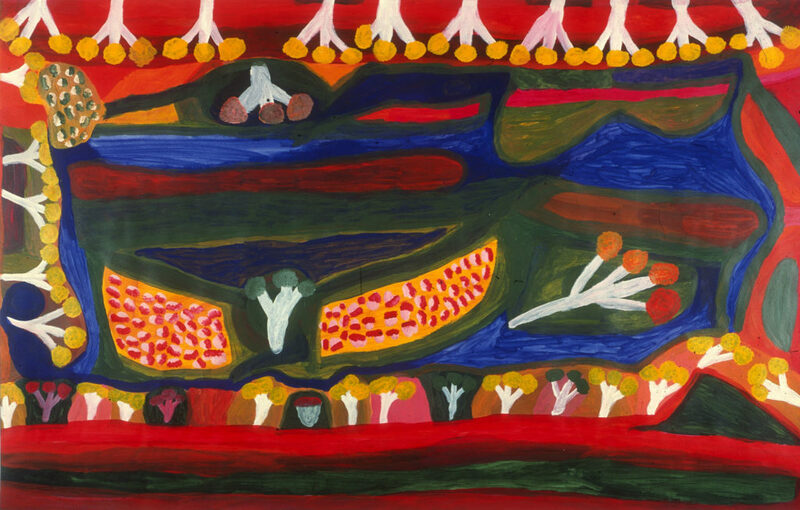 By featuring a wide variety of Aboriginal or Torres Strait Islander artwork, we wish to represent and acknowledge the diversity of our users and be inclusive of the many Aboriginal and Torres Strait Islander cultures throughout Australia. We also want to provide a welcoming and culturally safe place. 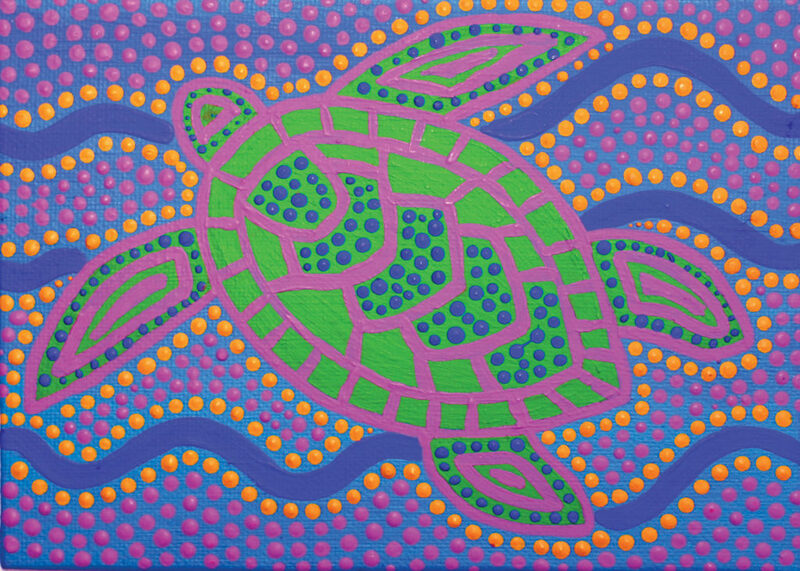 The majority of the sections of the website have their own distinctive Aboriginal or Torres Strait Islander artwork which helps users to identify which section they are in. The art on our website is ethically sourced; artists are paid for their artwork and copyright permission is obtained to display the artwork. We hope you enjoy reading about the artist and their artwork in our gallery. Janganpa Jukurrpa (Common Brush-tail Possum Dreaming, Trichosurus vulpecula) travels all over Warlpiri country. This part of the story comes from a big hill called Mawurrji, west of Yuendumu and north of Pikilyi (Vaughan Springs). There is a Mulju (water soakage) there that was created by Janganpa ancestor. ln the painting the 'E' shaped figures represents the possum tracks. The concentric circles are the trees in which the possums live, and also the sites at Mawurrji. Warlpiri people have a young men's initiation ceremony with Janganpa Jukurrpa. 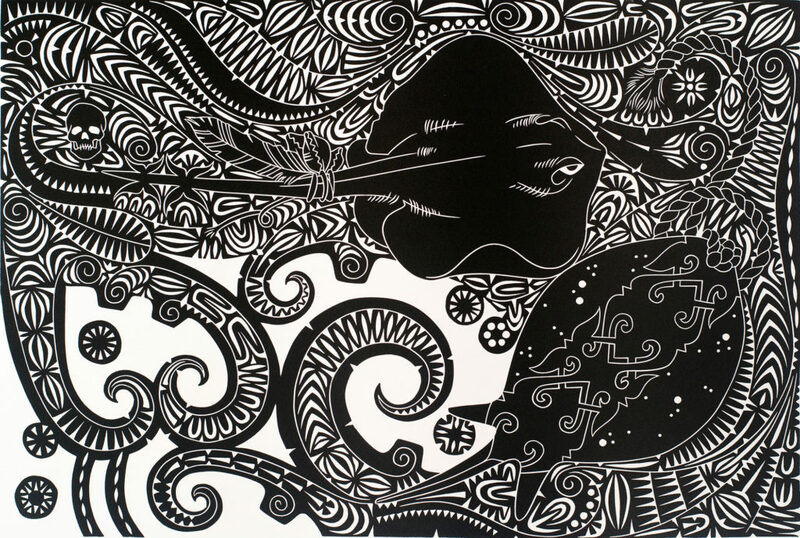 The Dreaming belongs to Jakamarra/Jupurrula men and Nakamarra/Napurruia women. 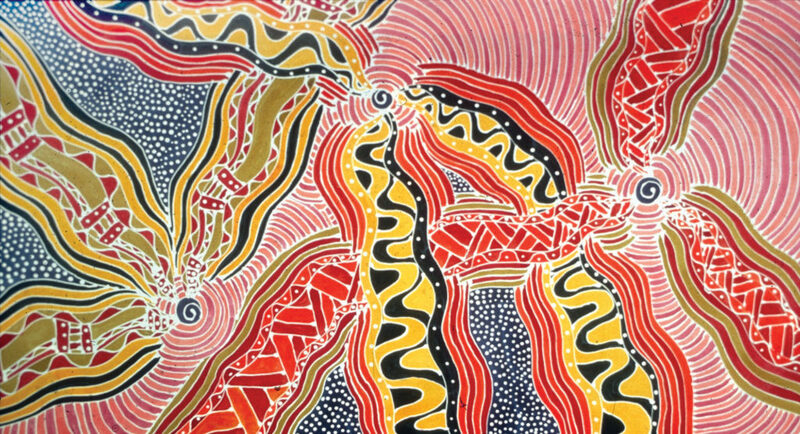 This painting: depicts the Pamapardu Jukurrpa (Flying Ant Dreaming) from Wapurtali, west of Yuendumu. 'Pamapardu' is the Warlpiri name for the flying ants or termites that build the large anthills found throughout Warlpiri country. This country belongs to Nakamarra/Napurrurla women and Jakamarra/Jupurrurla men. 'Pamapardu' are flying ants. They build earth mounds ('mingkirri') that are common in the Tanami area. When heavy rains come in summer the 'mingkirri' get flooded out, so the 'pamapardu' grow wings and fly off to make new homes, following their queens to dry mounds or to build anew. When they have found their new home they drop their wings in this stage they can be collected, lightly cooked in coals and eaten. As they fall to the ground women collect them to eat because they are nice and sweet. 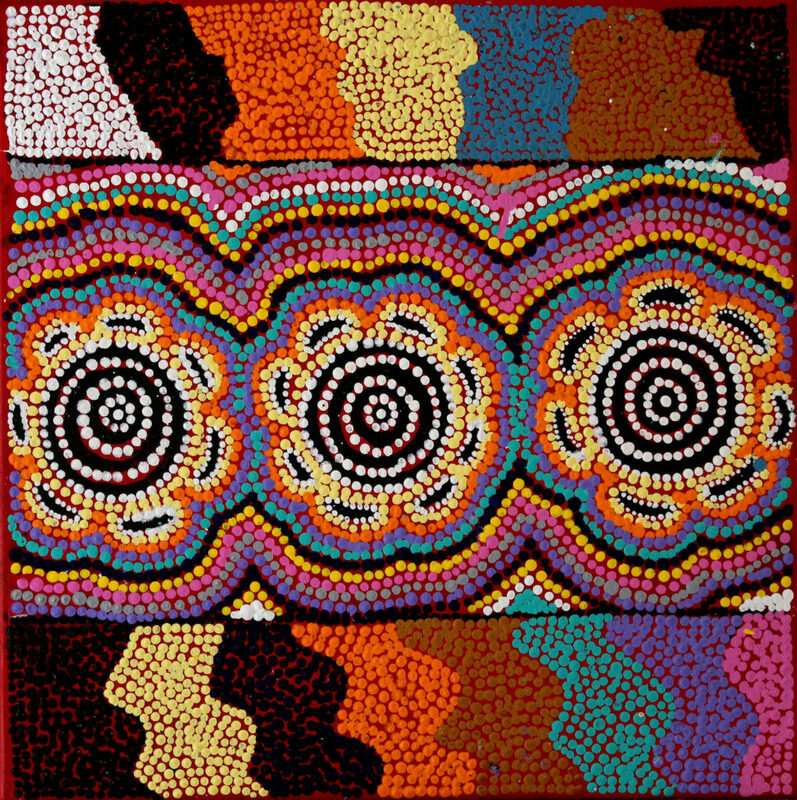 In contemporary Warlpiri paintings traditional iconography is used to represent the Jukurrpa, particular sites and other elements. 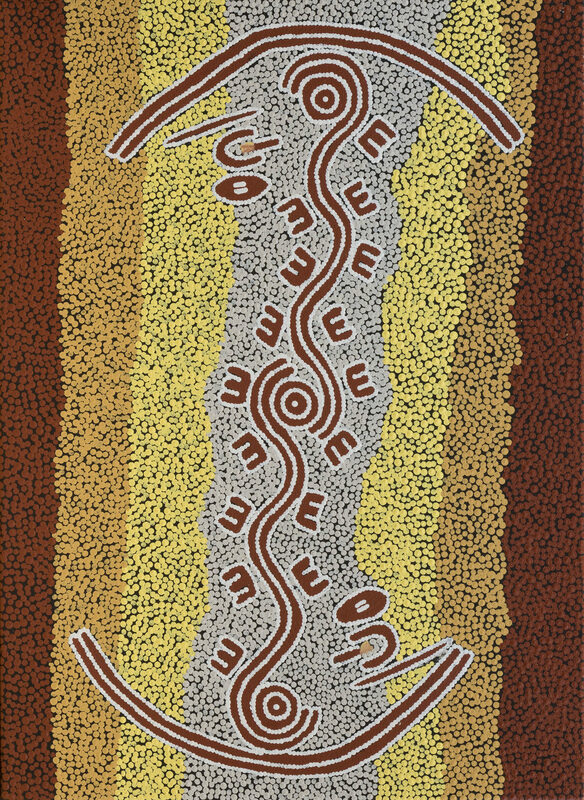 When this Jukurrpa story is painted concentric circles are used to represent the 'mingkirri' and the rockholes involved in the story, including the central one at Wapurtali (Mt Singleton). Dashes are often depicted around the circles to represent the 'pamapardu'. The country associated with this Jukurrpa is Mina Mina, a place far to the west of Yuendumu, which is significant to Napangardl/Napanangka women and Japangardi/Japanangka men. All of them are the custodians of the Jukurrpa that created the area. The Jukurrpa story tells of the Journey of a group of women of all ages who travelled to the east gathering food, collecting 'ngalyipi' (snake vine [Tinospora smilacina]) and performing ceremonies as they travelled. The women began their Journey at Mina Mina where 'karlangu' (digging sticks) emerged from the ground. Taking these implements the women travelled east creating Janylnki and other sites. Their Journey took them far to the east beyond the boundaries of Warlpiri country. The 'ngalylpi' vine grows up the trunks and limbs of the 'kurrkara' (desert oak [Allocawarina decaisneana]) trees. 'Ngalyipi' is a sacred vine to Napangardi and Napanangka women that has many uses. It can be used as a ceremonial wrap, as a strap to carry 'parrajas' (wooden bowls) that are laden with bush tucker and as a tourniquet for headaches. There are tracks leading to water holes and camp sites in and outside of towns. We all are able to gather and hunt for food to feed our families from these places. No matter where you live or what culture we come from we share these places together and look after them so we are able to return and enjoy them once more. The site depicted in this painting is Pirlinyarnu (Mt. Farewell), about 165 km west of Yuendumu in the Northern Territory. Two Jangala men, rainmakers, sang the rain, unleashing a giant storm that collided with another storm from Wapurtali. The two storms travelled across the country, from Karlipinpa near Kintore. A Kirrkarlanjl (brown falcon (Falco berigora]) carried the storm further west until It dropped the storm at Pirlinyarnu, forming an enormous Maliri (lake). A ‘mulju’ (soakage) exists in this place today. At Puyurru the bird dug up a 'warnayarra' (rainbow serpent). The serpent carried water with it to create another large lake. Whenever it rains today hundreds of 'ngapangarlpa' (bush ducks) still flock to Pirlinyarnu, The 'kirda' (custodians) for this Jukurrpa are Jangala/Jampijinpa men and Nangala/ Nampijinpa women. 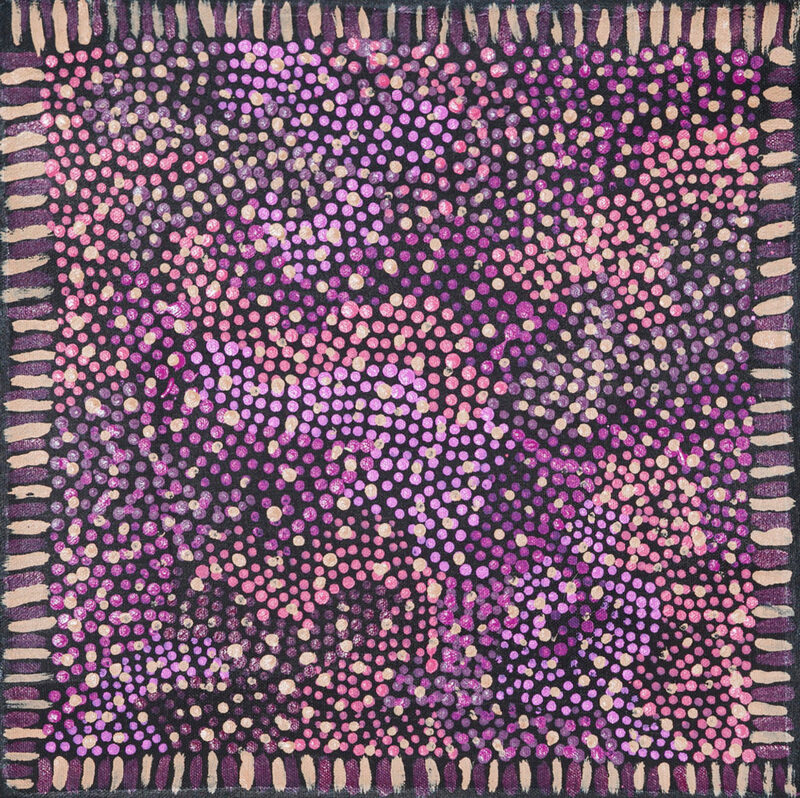 This Yarla Jukurrpa belongs to men of the Japaljarri/Jungarrayi subsections and to Napaljalrri/Nungarrayi women. It comes from an area to the east of Yuendumu called Cockatoo Creek. 'Yarla' (bush potato [Ipomea costata]) are fibrous tubers that grow beneath a low spreading plant, found by looking for cracks in the ground. This edible tuber grows from ‘yartura' (roots) which seek out moisture to spout new plants. 'Yarla are good to eat, when cooked they are really soft and tasty. The Jukurrpa tells of 'yarla' and 'wapirti' (bush carrot [Vigna lanceolatal) ancestors fighting a big battle in this area. 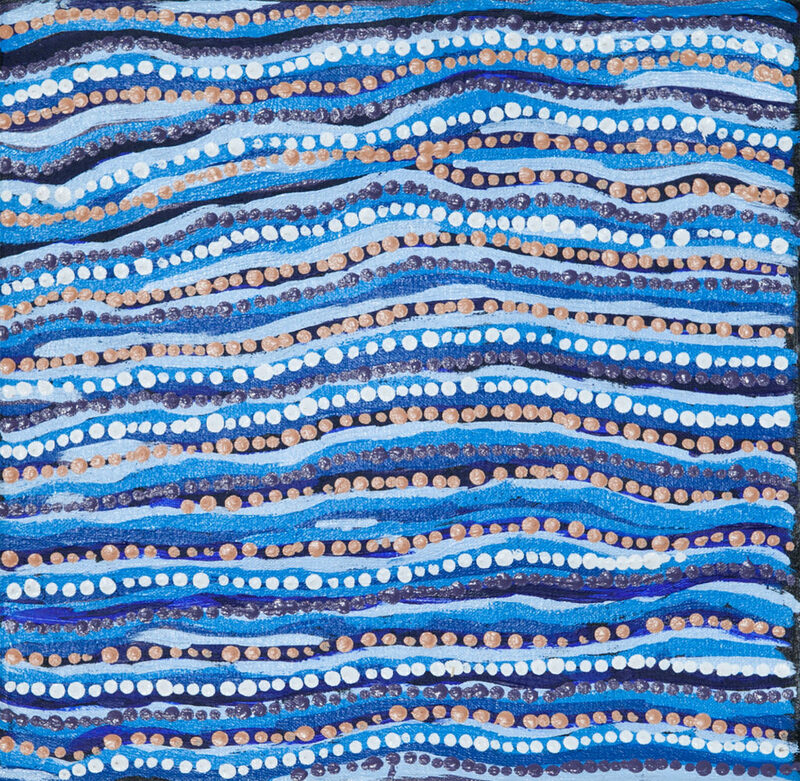 The specific site associated with this painting is a 'mulju' (water soakage) called Ngarparapunyu. 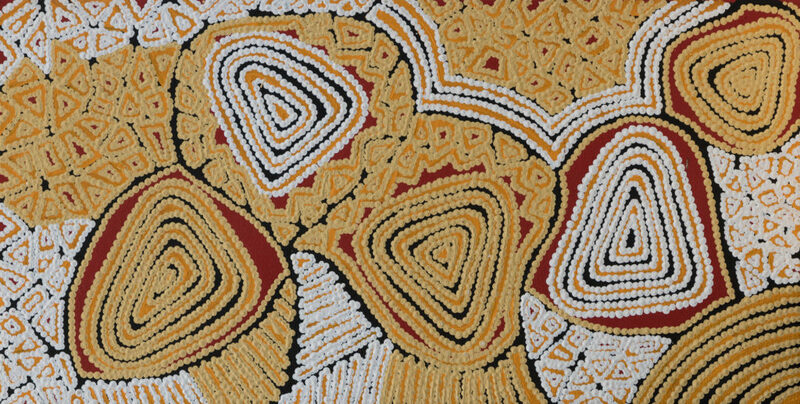 In contemporary Waripiri paintings traditional iconography is used to represent the Jukurrpa, associated sites and other elements. 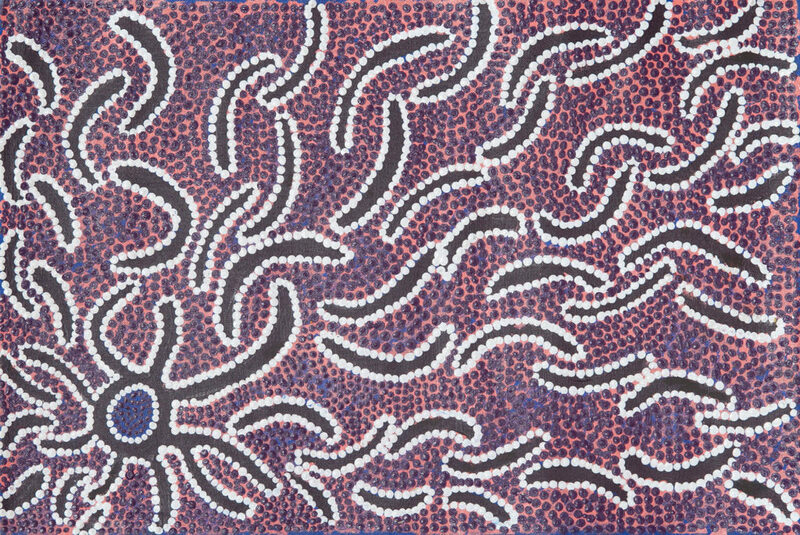 The curved lines of the 'kuruwarri' (ceremonial designs) represent the 'ngamarna' (vine-like tendrils) from which grow jinjirla' (flowers). ‘Karlangu' (digging sticks) are usually represented as strait lines. ‘Karlangu' are used by women to dig for bush tucker like Yarla and Wapirti which are found underground. The site depicted in this painting is Puyurru, west of Yuendumu. In the usually dry creek beds are water soakages or naturally occurring wells. Two Jangala men, rainmakers, sang the rain, unleashing a giant storm. It travelled across the country, with the lightning striking the land. This storm met up with another storm from Wapurtali, to the west, was picked up by a ‘kirrkarlan’ (brown falcon [Falco berigora]) and carried further west until it dropped the storm at Purlungyanu, where it created a giant soakage. At Puyurru the bird dug up a giant snake, ‘warnayarra’ (the ‘rainbow serpent’) and the snake carried water to create the large lake, Jillyiumpa, close to an outstation in this country. The story belongs to the Jangala men and Nangala women. 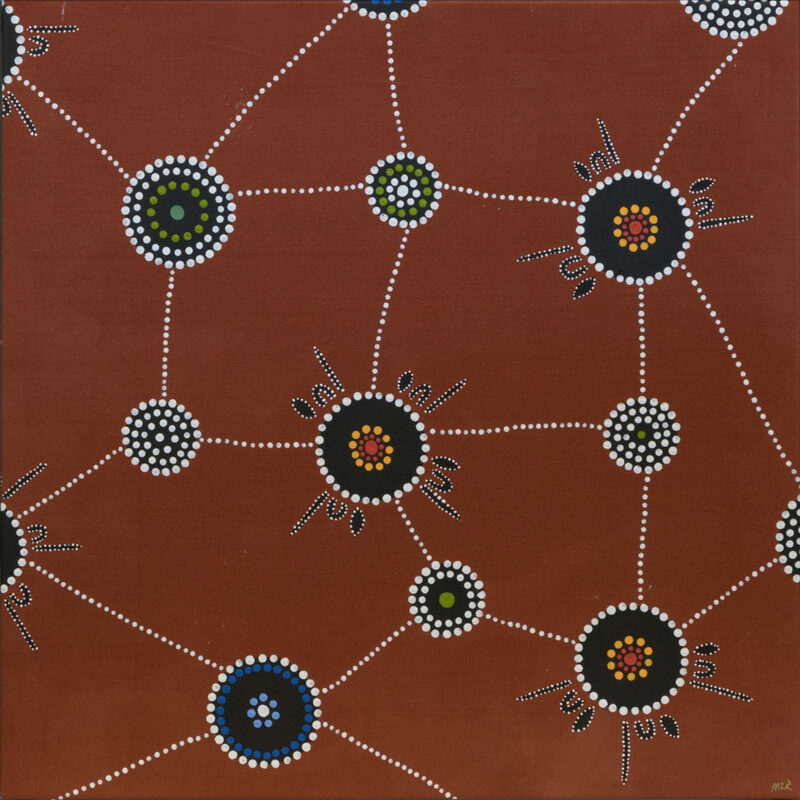 In contemporary Warlpiri paintings traditional iconography is used to represent the Jukurrpa, associated sites and other elements. In many paintings of this Jukurrpa curved and straight lines represent the ‘ngawarra’ (flood waters) running through the landscapes. Motifs frequently used to depict this story include small circles representing ‘mulju’ (water soakages) and short bars depicting ‘mangkurdu’ (cumulus and stratocumulus clouds). Nakamarra/Napurrurla women and Jakamarra/ Jupurrurla men. The Jukurrpa is associated with a place called Jaralypari, north of Yuendumu. Lukarrara is a species of Fimbristylis, a grass that bears edible seeds in the winter-time. The seeds are traditionally ground on a large stone ('puturlu') with a smaller stone ('ngalikirri') to make flour. This flour is mixed with water ('ngapa') to make small seed cakes. 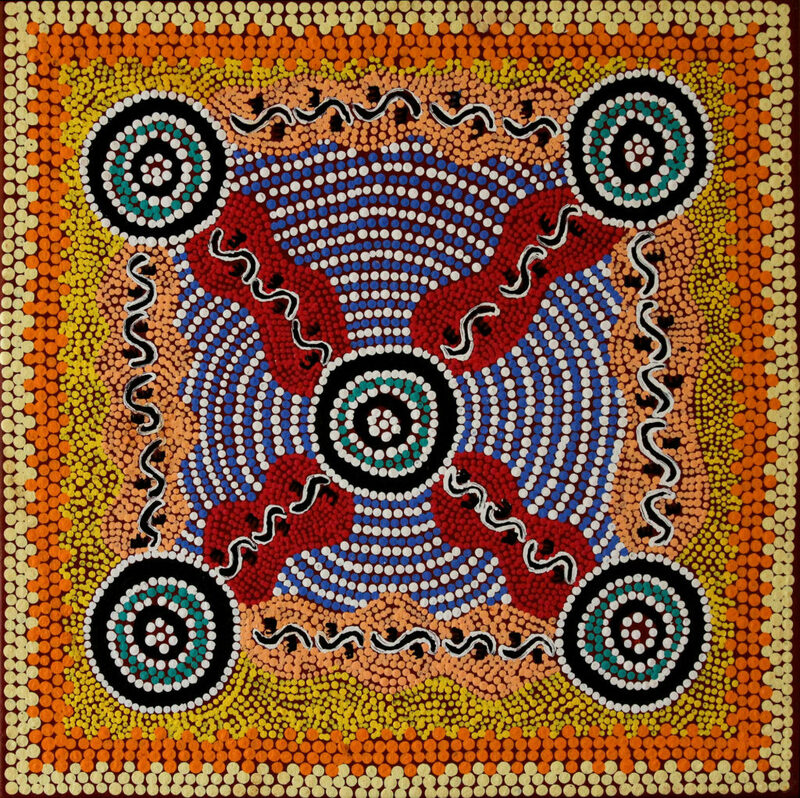 In contemporary Warlpirl paintings traditional iconography is used to represent the Jukurrpa, particular sites and other elements. 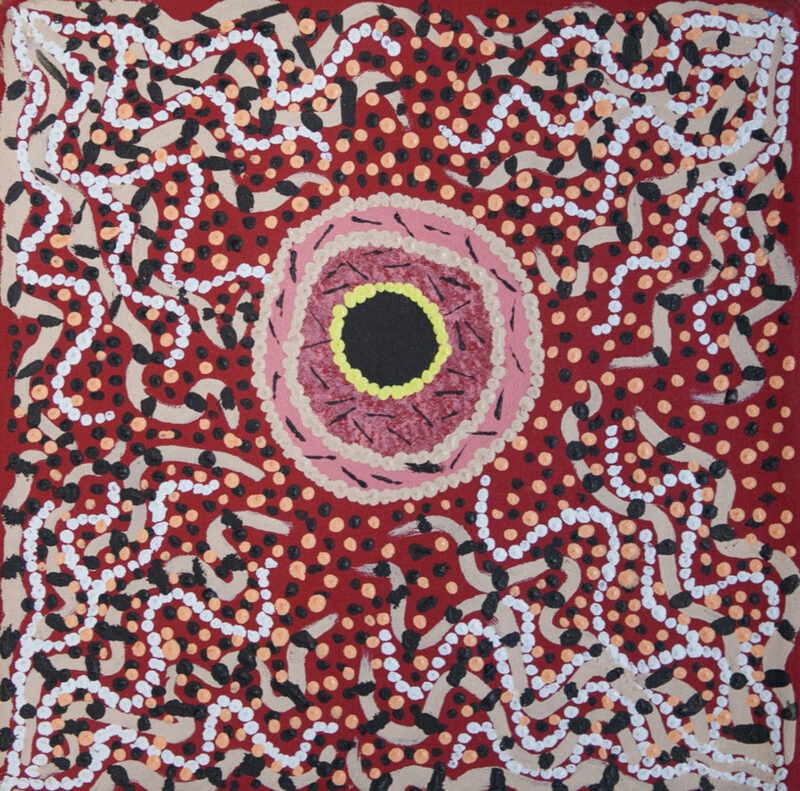 In paintings of this Jukurrpa large concentric circles are used to represent Jaralypari and dots surrounding these circles are often depicting the 'ngurlu'. The country associated with this Jukurrpa with this Mina Mina, a place far to the west of Yuendumu, which is significant to Napangardi/Napanangka women and Japangardi/Japanangka men. All of them are the custodians of the Jukurrpa that created the area. The Jukurrpa story tells of the journey of a group of women of all ages who travelled to the east gathering food, collecting 'ngalyipi' (snake vine [Tinospora smilacina]) and performing ceremonies as they travelled. The women began their journey at Mina Mina where 'karlangu' (digging sticks) emerged from the ground. Taking these implements the women travelled east creating Janyinki and other sites. Their journey took them far to the east beyond the boundaries of Warlpiri country. The 'ngalyipi' vine grows up the trunks and limbs of the 'kurrkara' (desert oak [Allocasuarina decaisneanal) trees. 'Ngalyipi' is a sacred vine to Napangardi and Napanangka women that has many uses. It can be used as a ceremonial wrap, as a strap to carry 'parrajas' (wooden bowls) that are laden with bush tucker and as a tourniquet for headaches. The site depicted in this painting is Puyurru, west of Yuendumu. In the usually dry creek beds are water soakages or naturally occurring wells. Two Jangala men, rainmakers, sang the rain, unleashing a giant storm. It travelled across the country, with the lightning striking the land. This storm met up with another storm from Wapurtali, to the west, was picked up by a 'kirrkarlan' (brown falcon [Falco berigora)) and carried further west until it dropped the storm at Purlungyanu, where it created a giant soakage. At Puyurru the bird dug up a giant snake, 'warnayarra' (the 'rainbow serpent') and the snake carried water to create the large lake, Jillyiumpa, close to an outstation in this country. This story belongs to Jangala men and Nangala women. 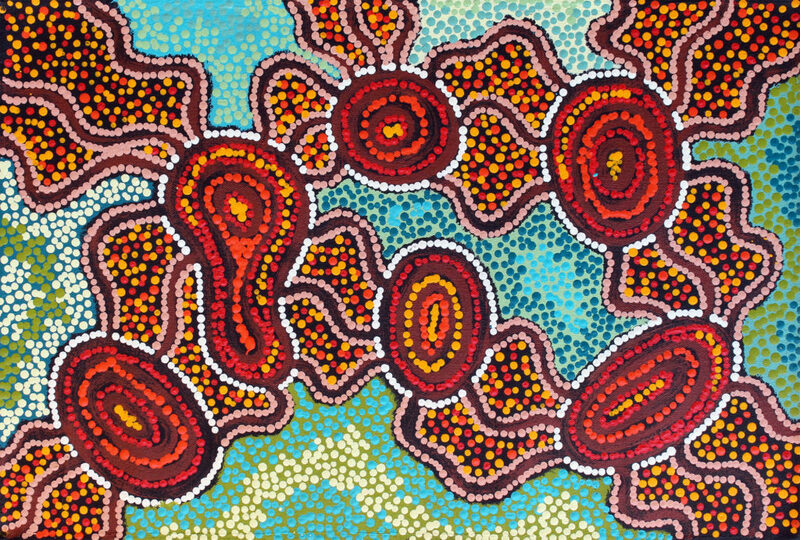 In contemporary Warlpiri paintings traditional iconography is used to represent the Jukurrpa, associated sites and other elements. In many paintings of this Jukurrpa curved and straight lines represent the 'ngawarra' (flood waters) running through the landscape. Motifs frequently used to depict this story include small circles representing 'mulju' (water soakages) and short bars depicting 'mangkurdu' (cumulus and stratocumulus clouds). Nakamarra/Napurrurla women and Jakamarra/Jupurrurla men. The Jukurrpa is associated with a place called Jaralypari, north of Yuendumu. Lukarrara is a species of Fimbristylis, a grass that bears edible seeds in the winter-time. The seeds are traditionally ground on a large stone ('puturlu') with a smaller stone ('ngalikirri') to make flour. This flour is mixed with water ('ngapa') to make small seed cakes. In contemporary Warlpiri paintings traditional iconography is used to represent the Jukurrpa, particular sites and other elements. 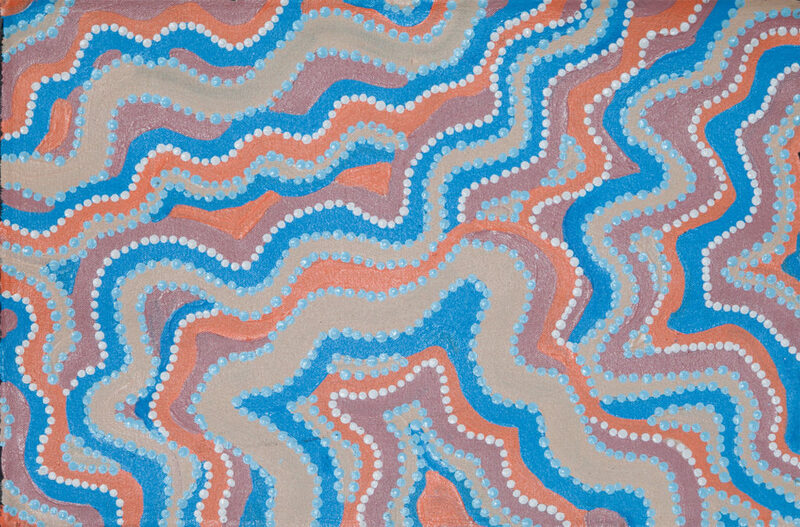 In paintings of this Jukurrpa large concentric circles are used to represent Jaralypari and dots surrounding these circles are often depicting the 'ngurlu'.